If you're like me, you hang the everyday purse that you drag around town with you on a convenient hook near the back door. If you need to pick up a kid from soccer practice, or you're just running a bit late for work, this grab and go location will allow you to get out the door and on your way quickly. Whether you carry a traditional clutch, hobo bag, backpack, or some other type of tote, hooks are a good way to store your everyday bag. Designer purses and other types of luxury handbags, however, have special storage needs. I recently saw a vintage Hermès Birken 40 Crocodile handbag listed on the internet for $$$$$$ (basically as much as a house). You definitely wouldn't want to dump that in the corner on the floor or suspend it from a hook by the back door. Luckily, not all designer bags are in the six figures. There are quite a few that list for only a few hundred dollars or are available "preowned" for a more reasonable amount. And then there are the women like myself — owner of a beautiful vintage white beaded clutch carried by my grandmother on her wedding day, my mother on hers, myself for my marriage, and hopefully my daughter for her eventual nuptials. This purse deserves and receives extraordinary loving care. All of these purses should be considered luxury pieces and require special attention. Designer purses or special occasions handbags should considered investment pieces, and understanding proper purse storage is essential to maintaining these items for future use or even resale. Clean your purse before putting it away. Only clean purses should be put into storage. How you clean your bag depends on the type of material it is made from. Use common sense when choosing a method to clean your handbag. Beaded bags should be wiped with a clean, damp (not wet) cloth using water only. Leather purses with a hard grain can be cleaned in a similar manner to leather shoes. Wipe it down with a damp sponge, a fragrance free baby wipe, or commercial leather cleaner such as "Meltonian". For suede bags, again think of the way you clean suede shoes. First try brushing the suede with a stiff brush to remove dirt. A toothbrush can work for this. If you have a stubborn spot or stain that won't come off the suede with brushing, you can try rubbing the offending area with an eraser, but make sure you are either using use a pencil eraser in a similar color to your bag, or better yet, purchase an artist's eraser available from your local art supply or craft store. These white artist erasers won't mar your bag with the dye that can come off of number 2 pencil erasers. If you have a fabric bag, you can go over it lightly with a hand held vacuum cleaner to remove loose dirt. For spots use a spot cleaner. These cleaners are usually formulated for specific types of stains, be they grease, blood, etc. Carbona is one brand of fabric spot cleaner that makes different formulas and is able to lift many types of stains. Test the cleaner in an inconspicuous are before applying it to the purse. Do not use water to clean it unless you are certain that your cloth accepts water as a cleaner. Many fabrics are dry clean only. If you are uncertain, it is best to take the purse to a professional cleaning service. Stuff the bag with acid free paper or plain white cotton sheets to allow the bag to keep its shape before putting it away. Handbags that are only used occasionally need to be stuffed with tissue paper or sections of clean, white sheets to help them hold their shape. Use acid free tissue paper available from your art supply store. Never use newspaper of colored tissue paper as these inks and dyes used on these materials can come off and stain the inside of the bag. If you don't have tissue paper, old cotton bed sheets in plain white can be used instead as long as they are washed with a laundry detergent that is free of dyes or perfumes, and all the soapy detergent has been rinsed out. Make sure the material you are using to stuff the bag is completely dry. Use plain white or acid free tissue to wrap any metal zipper pulls or chain straps. This may seem like a bit of a hassle, but metal components can leave a permanent impression when stored for long periods against leather. It is best to keep them wrapped when the bag is not in use. It is best to store purses upright. Oversize bags can be laid flat on their sides. Once the purse has been stuffed to hold its shape and metal parts are wrapped to prevent damage, place the handbag upright on a shelf, box or drawer. Oversize bags can safely be laid on their sides, but never fold the purse over or bend it in any way. 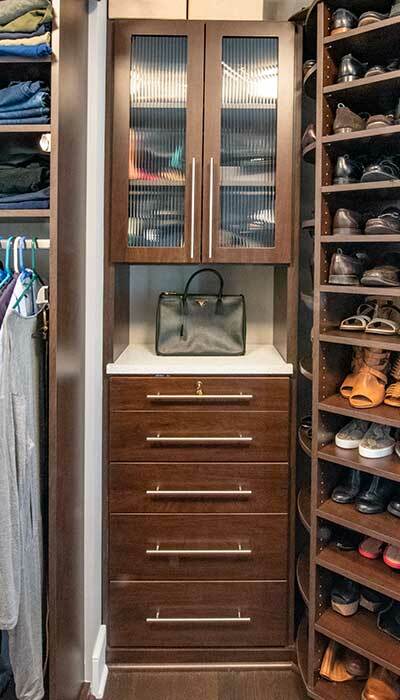 Store your designer purses inside your walk in closet behind glass doors. A lighted cabinet will display them like the works of art that they are. Because these special occassion bags are used infrequently, you will want to store them in a manner that prevents the accumulation of dust all over the purse. To solve this, luxury purses usually come with their own dust cover bags. The bags are made of soft, breathable cotton or other natural fabric. The downside to these storage bags is that they are opaque and you can't see which purse is inside which bag unless you open them all. It may be tempting to use a clear plastic bag so that you can see what is inside, but this is a bad idea. Never store a leather or suede purse in a plastic bag. Plastic prevents leather from "breathing" and the smallest amount of moisture/humidity will cause it to mildew and mold. Cardboard boxes, including hat boxes, are also often used. Although they offer protection from dust, they have the same issue with being able to see inside. If you want to avoid dust covers or boxes and be able to see the purse, keep it in a cabinet with a door. Cabinets with glass doors are especially helpful, as they allow you to see the entire purse collection very easily. An undershelf or panel LED lighting system will allow you to not only view all your purses at once, but can elevate the entire purse cabinet into a lighted display of art. Pull-out pantry shelves with shallow sides are very useful for storing clutches and small purses inside a purse cabinet. Damage from sunlight is also a concern, as the sun's rays have been known to dry out fine leather. 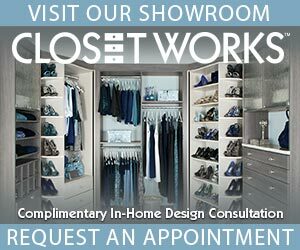 A good location for a purse cabinet is inside your closet. 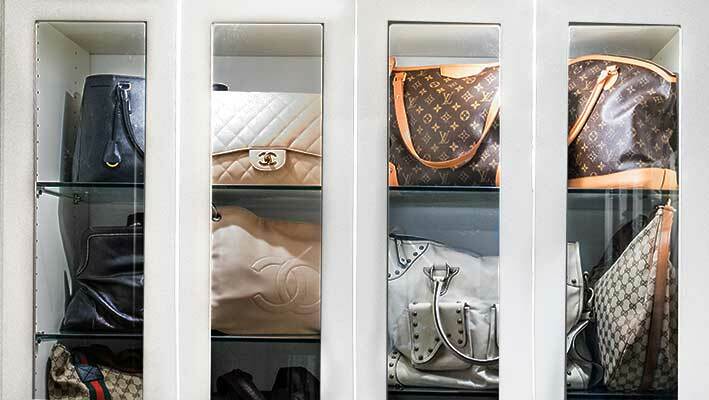 Most closets have limited or no windows, making them the ideal location to store expensive purses. If the closet does contain a window, keep the handbags out of direct sunlight. 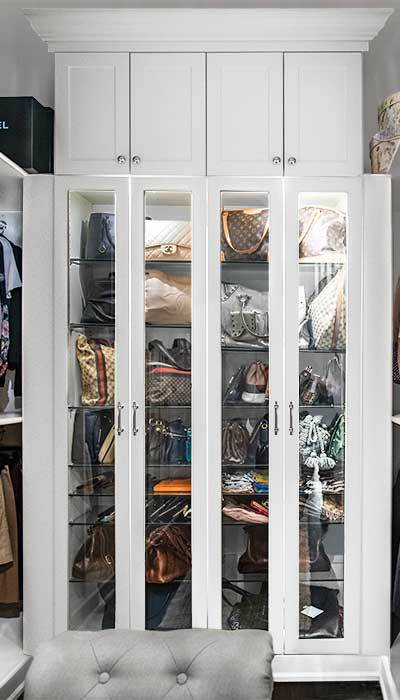 You can use solid cabinet doors rather than glass doors for your purse storage to keep out the sun. It is still much more convenient to be able to open the door and view your entire purse collection at once than to take them out of their cover or box one by one. As an added benefit, unlike cardboard boxes and dust bags, the cabinet doors can always accept a lock — enhancing the security of these expensive and often irreplaceable accessories. 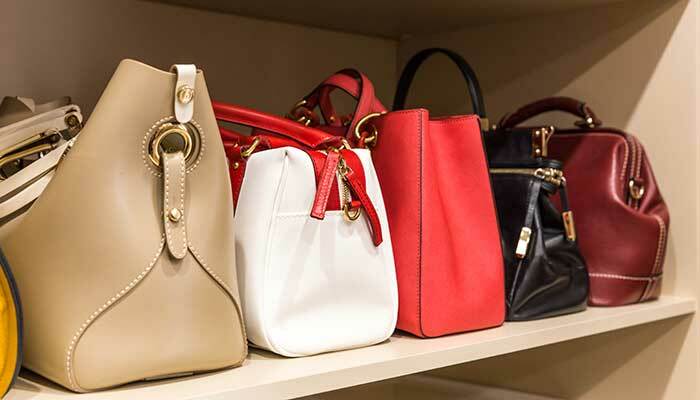 Whether due to the investment cost of owning designer purses or the sentimental value attached to an irreplaceable vintage handbag, it is important to have a good understanding of how to store purses and handbags so that they will last for many generations. Always take time to inspect the purse for dirt before putting it away and clean it if necessary. Stuff the bag with acid free tissue or pieces of undyed cotton sheets to help the bag hold its shape when not in use. Metal adornments on the bag should be coved with acid free tissue to prevent them from marking the leather. 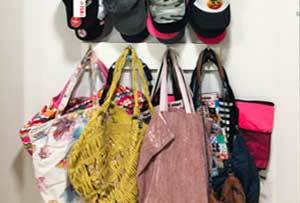 Store purses upright, or lay them flat on their side. Never fold a purse to make it fit into a smaller container. Store the purse away from dust or direct sunlight. 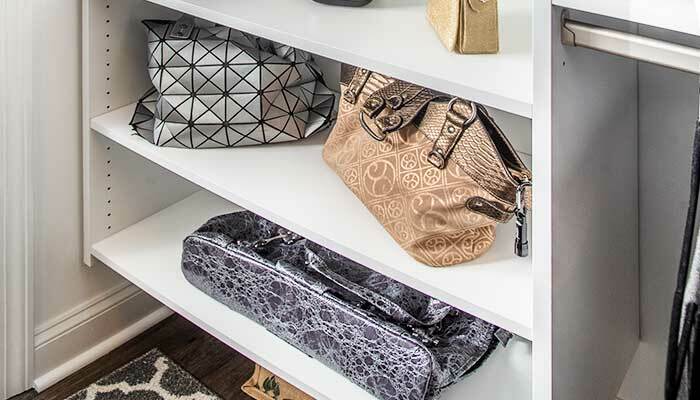 A special purse cabinet within the closet can be the perfect place to keep your handbag collection clean, safe, and away from sunlight while still allowing you to view the entire collection at any time. Locks and LED light systems can further enhance the display in your purse cabinet, keeping everything safe while showcasing each one as the work of art that many of these luxury pocketbooks truly are.